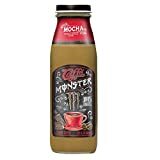 Caffe Monster Energy Coffee is a bottled RTD cold coffee beverage that is a combination of brewed coffee, green coffee bean caffeine, and coffee fruit extract. It is made by Monster Energy. 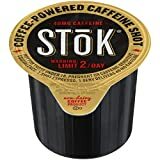 BREWED ARABICA COFFEE (WATER, COFFEE), REDUCED FAT MILK, SUGAR, GLUCOSE, SODIUM CITRATE, MICROCRYSTALLINE CELLULOSE, TAURINE, PECTIN, NATURAL & ARTIFICIAL FLAVORS, CELLULOSE GUM, SALT, MALTODEXTRIN, ASCORBIC ACID (VITAMIN C), CAFFEINE FROM GREEN COFFEE BEANS, SUCRALOSE, NIACINAMIDE (VITAMIN B3), COFFEEBERRY HAWAIIAN COFFEE FRUIT EXTRACT, PYRIDOXINE HYDROCHLORIDE (VITAMIN B6). Sugar content: 29 grams (per 13.7 ounces). 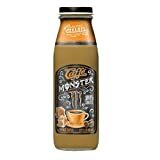 Caffe Monster Energy Coffee contains 12.77 mgs of caffeine per fluid ounce (43.19mg/100 ml).